Everywhere you look, there are sites "Breaking down the trade". We are not going to do that in this space. Rather than analyzing what each component of this deal means to each club, and then trying to decipher who wins, etc... Hockey Plumber would like to take a look at this trade and ask a few questions. 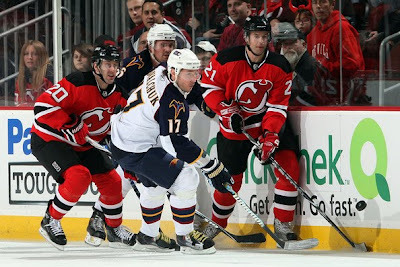 In exchange for Ilya Kovalchuk, defenseman Anssi Salmela and a swap of 2010 second rounders, the Thrashers acquired defenseman John Oduya, forwards Niclas Bergfors, the more infamous than famous, Patrice Cormier and the Devils 2010 first rounder. Got it? Good. 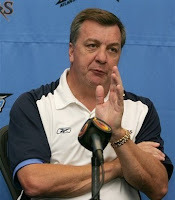 Obviously, New Jersey's offer was found to be most appealing to Don Waddell. Just before the transaction, the Thrashers GM was forthcoming with the details of the contract offer that was made to the star winger that created an impasse. Would you not love it if he were also forthcoming about the details of the other offers from L.A., Philadelphia, New York, Boston, and the surprise entrants St. Louis and Minnesota? Of course that kind of information will never be shared, but how fantastic would it be for hockey fans to be able to comb through the other offers that were found to be less appealing? Did L.A. offer J.J. and Frolov? Did Philly insist that Atlanta take on Briere's albatross contract, or the same from the Rangers with Redden's inflated deal? Just what exactly did the Blues and Wild propose? While the Thrashers fans secretly hope for Kaptain Kovy to come back after July 1, the Devils fans are rejoicing tonight. No doubt there are diehards, in Newark and beyond, scratching out new forward line combinations and giggling to themselves about their new hired gun... and even some that have started congratulating themselves on a possible Gold Medal and Stanley Cup 1-2 combo for Marty before he receives his rocking chair at center ice in the Prudential. Those same Devils fans are mulling over the same questions that we all are: Will Kovy accept playing the defensive game that their system demands? Or will Coach Lemaire loosen things up a bit now that they have a bona fide sniper? Will it matter? The Devils improved themselves offensively, but the question that should be asked: Although they gave up the second least amount of regular season goals in 2008/09, wasn't it the Devils that got bounced by Carolina in Round One of the Playoffs last year by leaking 4 goals in three of their four losses? Then rewind one more season. Those same stingy Devils twice yielded 4 goals and even 5 goals two more times in losing to the Rangers in Round One as well. 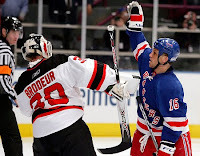 Who cares how many goals will Kovy score, the real concern will be how many will he PREVENT in the 2010 Playoffs? he really won't prevent all that many. Come on. The guy is a plus 1 this year. Not gonna happen. Good thing Marty is between the pipes!